Peresoft is pleased to announce the release of Cashbook, RecXpress and EFTXpress 6.0A. 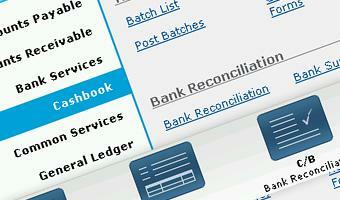 Run Cashbook in the Sage ERP Accpac Portal. The Sage ERP Accpac Portal is a new web-based interface that lets you use Sage ERP Accpac in a browser window. The portal delivers all the features you're familiar with from previous versions. Individual Fiscal Period Lock for Cashbook in the Sage ERP Accpac Fiscal Calendar. You can now lock and unlock fiscal years and periods separately for Cashbook in the Fiscal Calendar. Cashbook, LanPac, RecXpress and EFTXpress 6.0A Client SupportPlus Upgrades and Solution Provider Demos with the relevant Serial Numbers and Activation Codes are available for download in the SupportPlus section of the Partner Area on the Peresoft website. The above Peresoft 6.0A products are also available for download in the MCD Product Downloads section. © 2011 Peresoft Software & Support. All Rights Reserved.